Okay, maybe I’m not really an introvert. Or, at least, it’s up for debate. I’ve never taken any sort of test to see where I lie on the “ex-in” spectrum. If I had to guess, I would put myself somewhere on the “in” side of center. I mean, I don’t actively avoid social interaction. Going to clubs and concerts is fun. There have been times in my life when I have happily hosted regular dinner parties with large groups of people. I even enjoyed myself. But it is a serious effort. My husband is what I would consider more of a ‘true’ introvert. He has greatly expanded his social repertoire since hooking up with me, but is pretty much a loner when left to his own devices. He actively avoids large social gatherings and is Quickly exhausted in situations where he is surrounded by people. He’s sensitive to noise, and much prefers a quiet walk in the woods to a loud concert. When I spend time with lots of people – whether in large public settings like a festival, or more intimate social gatherings – I always reach a point where I just feel done. Like I’ve reached my limit. I start to get a little anxious; to lose my patience and tolerance. It’s time to recharge. Sometimes I just need the night off, but other times I need a longer break. My son, Jack, is somewhere between my husband and I. More introverted than me, but more social than his Dad. He struggles with noise and overstimulation. He also struggles with ADHD, making things like waiting in line…or waiting for anything…that much more challenging. Needless to say, when my Aunt and Uncle gifted him a Disneyland trip for Christmas, we were not excited about it. After delaying the inevitable for two years, I decided that we’d better bite the bullet. 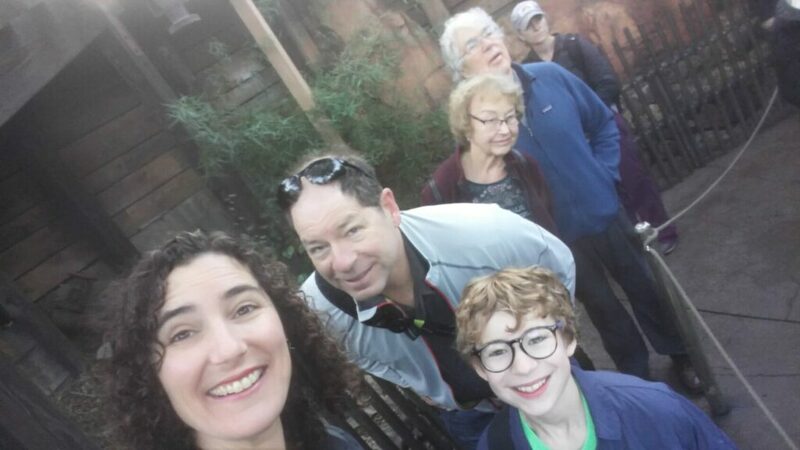 My Aunt and Uncle are in their early 80s, and who knows how much longer they will be able to enjoy taking Jack to the Magic Kingdom? 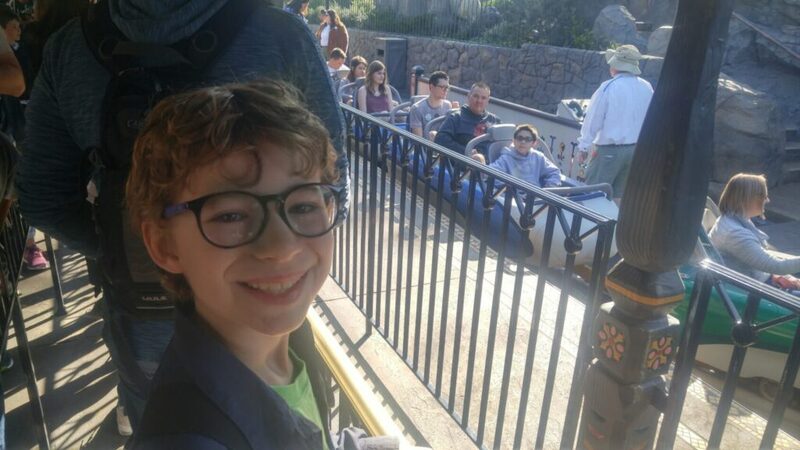 And, at 9 years old, Jack is fast approaching an age when much of Disney will start to lose its magic. As much as I was personally anxious about the ordeal, we had to do it. It was time to go to Disneyland. I’ll admit, I was dreading this trip a little. Even though I love carnival rides, and have great memories of Disney from my own childhood. Selfishly, all I could think about was how exhausting it would be as a parent. Luckily, I channeled my anxiety into researching the best ways to navigate the park most efficiently. And it paid off. I survived (as did the rest of my mostly-introverted family). Here are the things that helped us the most. 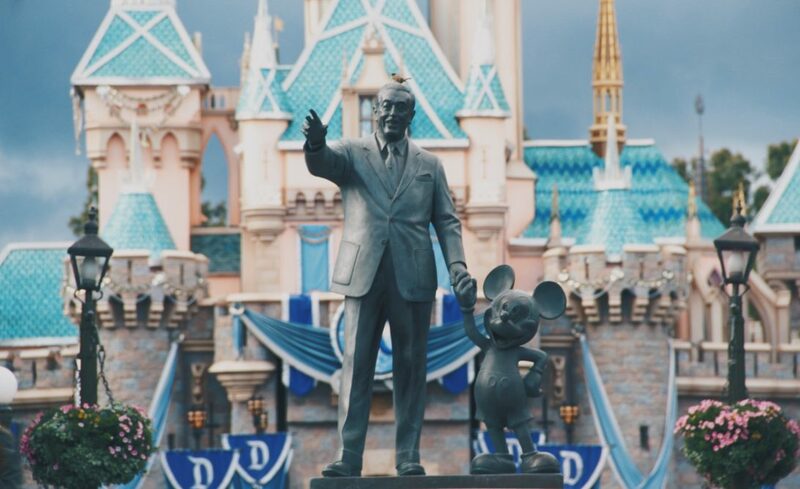 When planning your trip to Disneyland, remember – not all dates are created equal. The time of year you choose for your visit could greatly affect your experience in the park. We decided to avoid big school holidays (summer, winter, and spring vacay), as those are some of the busiest times. Actually, any holiday is a bad idea. I happened to read that the weeks between Thanksgiving and Christmas school holidays were relatively quiet, and had the added benefit of holiday themes. We took Jack out of school the second week of December, and it was totally worth a little truancy. The bartender at our hotel, who has worked there for 10+ years, said the slowest time of year is actually between January 3rd and President’s Day. 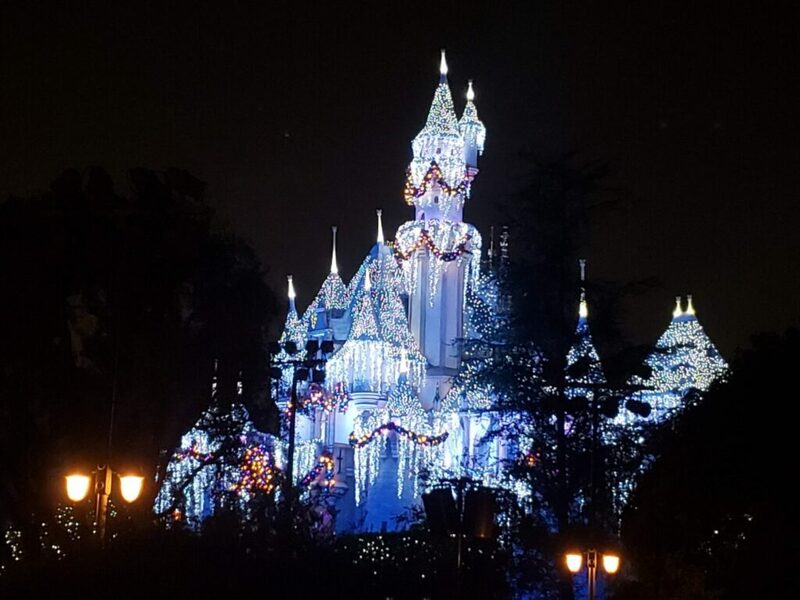 In general, though, pulling your kids out of school to visit Disneyland out of season, in the middle of the week, is your best bet for small crowds and short lines. 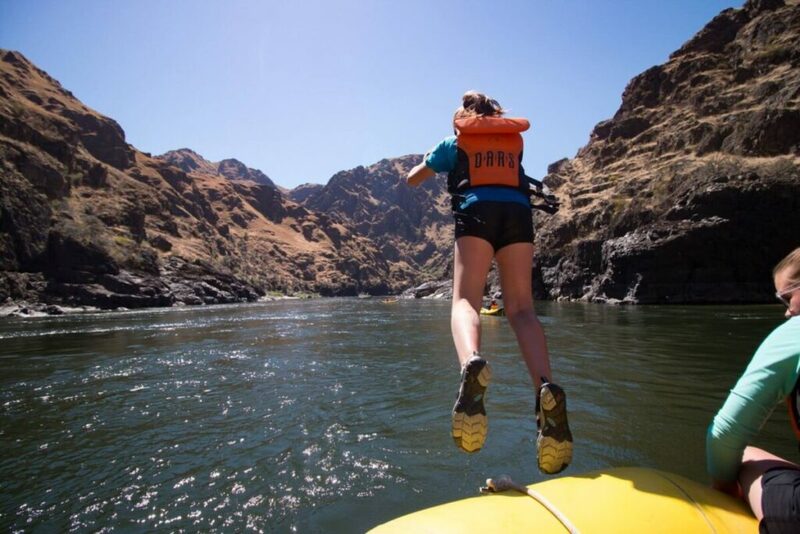 The Undercover Tourist has more ideas for best times to visit in 2019. Where you stay is also important. Picture this: It’s 1:30 in the afternoon. You’ve been riding rides and navigating the park since 8 a.m. You have a headache. Your children are tired. You’re tired. Lines are growing steadily, and crowds are beginning to fill the streets. Your youngest starts to cry. Guess what? If you chose a hotel that is close by, preferably with a pool or some other source of entertainment, you can go back to your room for a break. If not, you are stuck in the park for as long as you can gut it out. The choice is yours, but I say spend the extra dough to get a place close by. If you can’t afford one of the affiliated Disneyland Hotels, there are lots of chains within a block of the Park. Try Sheraton, Red Lion, or America’s Best Value Inn. As a matter of course, I am not a great planner. When I travel alone, or when the planning is left to me, I usually opt for the “by the seat of your pants” method. For this trip, however, I decided to do some research, and was really glad I did. I found lots of sites that talked about the importance of planning out your days, but the best one was RideMax. RideMax is a software program that uses almost a decade of wait time and park user data to plan every move you make in the park. It’s not free (I paid $19.95 for a 90-day subscription), but it’s worth every penny to avoid those crowds. All you have to do is figure out which rides and events you want to experience, and what sort of breaks you need. The software creates a schedule for you that minimizes your wait time and helps avoid the worst crowds. And, if you are like my family, basically preserves your sanity. If you don’t want to spend the money on RideMax, you can make similar schedules yourself by doing a little research ahead of time. 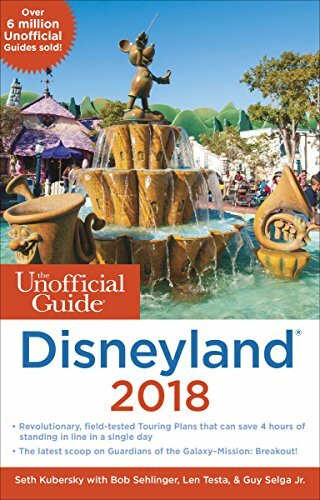 The Unofficial Guide to Disneyland has great information about what rides fill up the fastest in the morning. It also discusses how traffic patterns move through the park throughout the day. During my reading, I came across several blogs that mentioned bag size as an important factor to consider. Most rides in Disneyland provide small pouches for securing your personal belongings during the ride (think seat-back pouches on airplanes). These pouches will not fit a full-sized backpack in them. And, though Disneyland is a pretty safe place by today’s standards, it’s still not somewhere you should leave your backpacks lying around. As with most parents, I wanted to carry a water bottle and snacks for my kid, and didn’t want to hold everything in my hands. That’s when I discovered Baggallini. Now, I’ll admit it, I didn’t pay full price for my Baggallini (thank goodness for Kohls), but knowing what I know now, it would have been worth it. Baggallini has a wide variety of travel-friendly handbags, all equipped with zipper pouches and multi-use straps. They are compact, lightweight, and weather-resistant. The company was started by 2 female flight attendants who know the ins-and-outs of traveling light. By far and away the most effective tool we had for avoiding long lines was the Disneyland App. This app helps you navigate the park, shows you up-to-the-minute wait times for each ride, stores your tickets and passes, gives you the location of all the characters, and allows you to acquire FastPass tickets from your phone (see below). You can do a lot of other things we never tried, as well – like purchase tickets to the park and make dinner reservations. The app is free to download and easy to use. If you have the Disneyland App, you can purchase MaxPass, and I highly recommend this for all you introverts out there. If you’re like me, and it’s been 20 years since you visited the park, you may not have heard of FastPass. Basically, for a number of the rides with more tourist pressure, Disney offers FastPasses. These are free, and dispensed by a kiosk near the ride on a first-come-first-served basis. Instead of waiting in a 45-minute long line, you can put your park ticket into the kiosk, and it will provide you with a one-hour window to return to the ride. When you come back, you swipe your park ticket through the FastPass reader and it lets you into a separate (shorter) line. Getting a FastPass generally cuts your wait time down to less than 1/3, and allows you to go on other rides while you wait. Unfortunately, you still have to physically walk to each ride to get the FastPass, often fighting through crowds of people to get there, then stand in line at the kiosk in order to receive your time window. This is almost as bad as waiting in line for the ride. If you purchase MaxPass through the Disneyland App, you can secure FastPass tickets right from your phone! While you are on another ride! No crowds! No waiting! It costs $10/person/day. 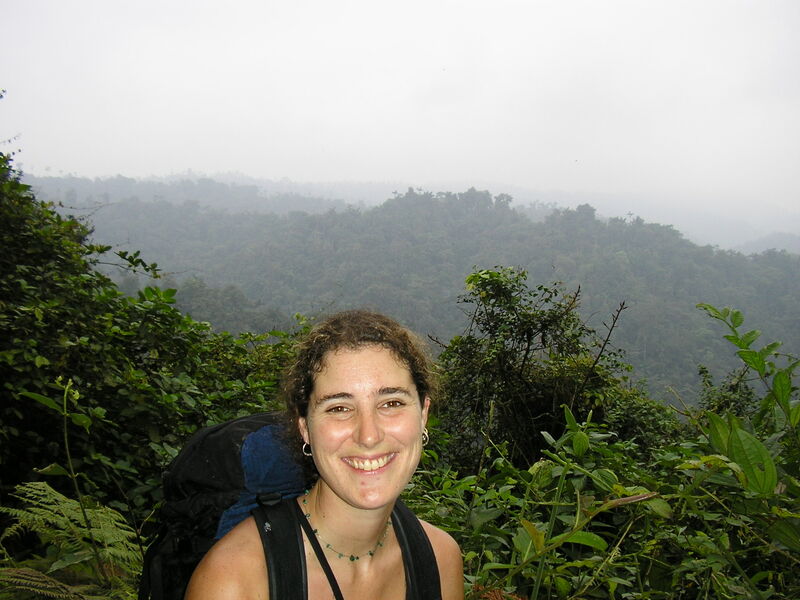 I know, another expense – but how much is your time and sanity really worth? When I was a kid, I’m pretty sure we only spent one day at Disneyland. It was a long, exhausting day, but we managed to see all of the park and ride all the rides we wanted in a single day. 35 years later, I don’t think that’s even possible. Especially if you have multiple kids, or kids that want to track down all the characters or get dressed up like a princess. Plus, there are now 2 parks – Disneyland and Disney California Adventure (DCA), and you will need at least a full day to experience each one. I recommend you plan on having at least 2 days in the park. Not only will it allow you more time to see all the attractions, it will also give you the freedom to avoid the busiest times (and thus the largest crowds). We found that both parks started getting almost intolerably crowded around 2 p.m. each day (in the middle of the week). Since we were staying in the Paradise Pier hotel (one of the hotels attached to Disney), we timed our days to be in the park when it opened. By the time it started to get really crowded, we were ready for a long break at the hotel. As I mentioned above, crowds get bigger as the day progresses. Fight your inner sloth and take advantage of the thinner morning hours. Nap in the afternoon if you need to. Also, if you stay at one of the Disneyland hotels, you will get one “magic morning” during your stay – this allows you to enter the park one hour early (7 a.m. instead of 8 a.m.). This is great, as you can get all the most desirable rides out of the way before the crowds get in. If you are an introvert, you probably already know this – skip the parades. They are by far the busiest, most annoying times in the park. I suggest getting out of the park altogether during parade times. If that isn’t an option, use the Disneyland App to figure out where the parade route is, and at least steer clear of that area. Same goes for the fireworks displays and any light shows like Fantasmic! 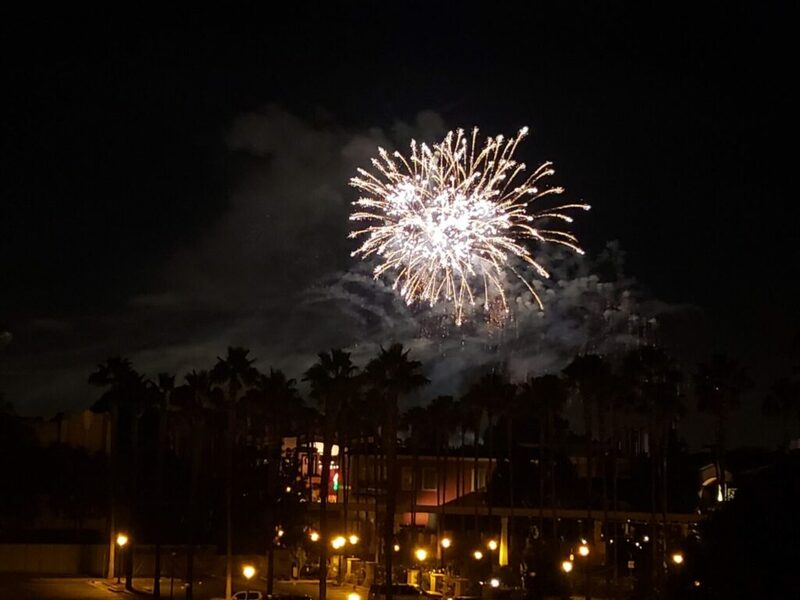 If you are staying close to the park, chances are you can see the fireworks from your hotel, and the Disney hotels actually have viewing areas. This one seems obvious, but really – take snacks and water. 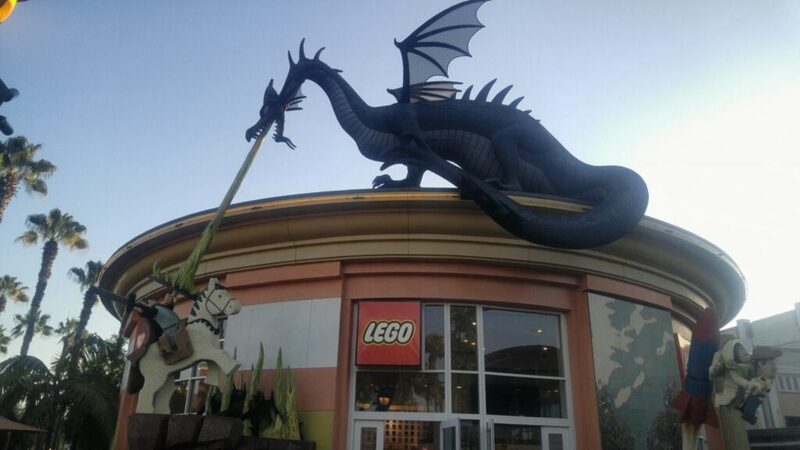 There is no problem getting them into the park, and your wallet will thank you later. Seriously – a bottle of water is $4, I’m not joking. It’s like being in the airport. And there aren’t a lot of convenience stores or restaurants within walking distance of the park. Once you are inside, you won’t want to leave anyway, so bring everything you need with you. 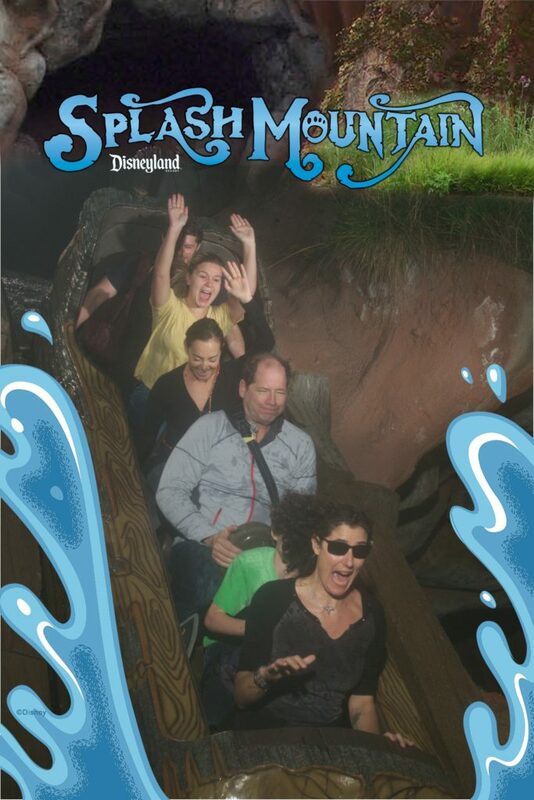 If you do your research, and go prepared, even an introvert can have fun at Disneyland!